Fun and unique! Three tiers Play Ball! 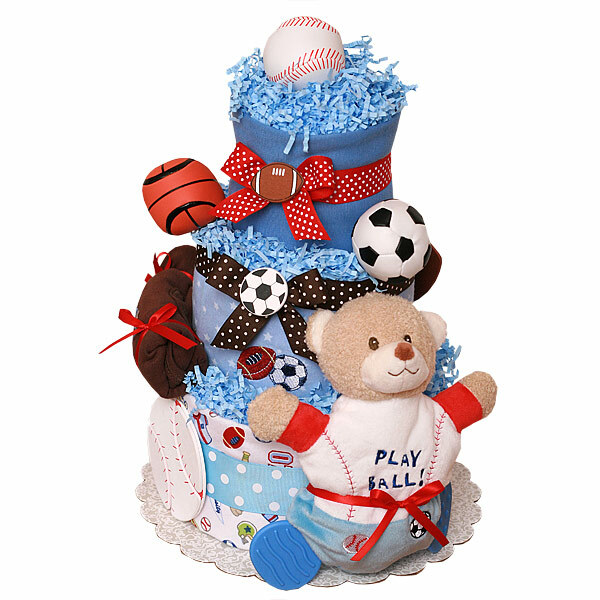 Sport Diaper Cake is made of 40-45 Pampers Swaddlers diapers size 1-2 (8-15 lbs. ), Two flannel receiving blankets 100% Cotton, Two bodysuits with sport theme; One soft baby toy Wooby Chew Bear (Crinkle, Rattle, Teether); lots of bows, wooden embellishments with sport theme. The diapers are held together by elegant ribbons (no glue on diapers). Decorated with pins, bows and crinkle paper. Ribbons are hand-stitched with white embroidery floss on the back of the cake, allowing for a clean, handmade look.